The Galloway Barn: How it looked for 130+ years vs how it looks today. Severe weather ripped through Van Buren County on July 19 with two EF-1 tornadoes touching down near the county seat of Keosauqua. One of the twisters destroyed a piece of the county's history, but not before its image could be captured on canvas. The Galloway Barn was built in the late 1880’s. It stood about 150 feet tall at its peak, with white, wooden walls, a stone foundation, and four rows of windows. It was added to the National Register of Historic Places as the “Midway Stock Farm Barn” in 1999 due to its use as an agricultural barn in the late 1910’s. Brad Klodt, who manages the Facebook Page: Barns of Van Buren County Iowa, which provides information about the county’s historic 100+ year old barns, said the Galloway Barn stood out because of its size. He said most of the historic barns in the county were built to house only a handful of animals but the Galloway Barn was different. Klodt said building it into the side of a hill provided more room for livestock to be brought into the barn. He said it also improved the stability and helped regulate the temperature of the barn, keeping it cool in the summer and warm in the winter. Klodt said the best way to describe the Galloway Barn was as a “landmark of Van Buren County.” But the landmark is no more. Several tornadoes ripped through central Iowa that afternoon, with some of the worst damage being seen in Pella and Marshalltown. A few hours later, the skies started to turn in Van Buren County. Steve Kisling of Keosuaqua was driving home from Ames, Iowa that day. Kisling said he took his time coming home, eventually stopping in Oskaloosa, Iowa. He said that’s where he found clear skies and sunshine, so he got back on the road for Van Buren County. He said it eventually started raining again. 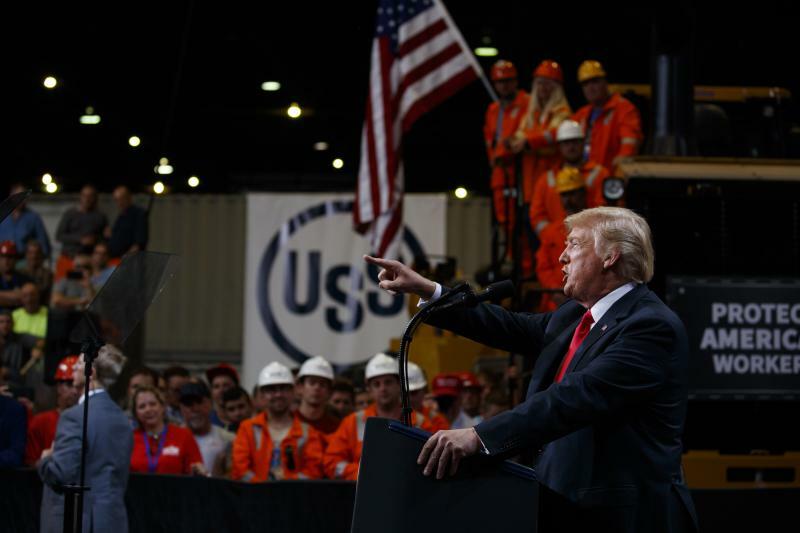 Looking back, Kisling said that might not have been his best idea because the rain picked up and the wind started to howl, making it difficult to keep his truck on the road. He decided to pull into the driveway leading to the Galloway Barn. He knows the family well and even loaded cattle out of the barn when he was younger. Kisling missed the driveway, though, while he was concentrating on driving. He did look out his window, just as the barn was in its final moments. “I looked back and [the barn] was going up in the air. And it went, I don’t know how to gauge it, there is nothing around it, but I would say at least 10 feet off the ground,” said Kisling. He said the bulk of the barn went straight up and slammed down, splintering into thousands of pieces. Kisling said after witnessing that, he decided he needed to get home so he drove off, fighting to keep his truck on the road throughout the trip. Bob and Sharon Galloway live in a two-story brick home near the intersection of Highways 1 & 16, a few miles north of Keosauqua. The barn was located a couple hundred yards south of their farmhouse. Sharon Galloway said the barn had been in her family for about 60 years. But she was not around for its final moments because she and her husband were visiting friends in Farmington when the storm hit. Sharon Galloway’s daughter, Marydawn Schuck, called her as the storm intensified on July 19 to make sure her mom and her step-father were safe. Galloway said as soon as it was safe to leave, she and her husband drove home to check on the damage. She said her husband walked out to inspect it but she did not, choosing instead to visit the giant pile of rubble the following day. That was Galloway’s initial reaction when she saw for the first time what remained of the Galloway Barn. Galloway said as soon as the storm passed, neighbors and friends started calling or stopping by to offer to help with the clean-up. She said while her family appreciates all of the offers, they plan to wait until the ground hardens to start the clean-up. 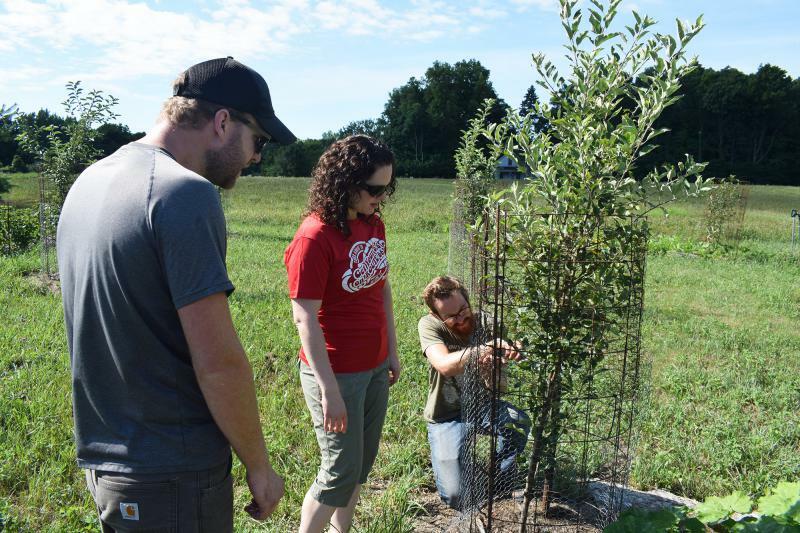 “We know that’s what Van Buren County is like and what the people who live here are like,” said Galloway. The storm actually answered a significant question for the family. Galloway said the barn needed about $40,000 in repairs -- namely a new roof -- and all it was used for was storage. So she said the tornado helped answer the question of whether it was worth spending that much on the structure. Marydawn Schuck was shocked when she saw the barn on the ground. She said she thought back to her youth, playing in the barn with friends and family. “When I was little, I had a brother who was two years older and a sister who was four years older, and we used to play out there all the time. And there would always be cats and we would kinda play hide and go seek and all that kind of stuff,” said Schuck. Schuck said, looking back, the biggest surprise was not that a tornado with winds of around 100 miles per hour knocked down a 130+ year old wooden barn. She said it was the fact that there were professional artists on-site a few hours earlier, documenting the final hours of the Galloway Barn. The Villages Folk School sponsored an art competition as part of the Van Buren County Fair titled “Paint the Fair.” It took place July 19-20. Mel Stockwell of the Villages Folk School said about a dozen artists from throughout southeast Iowa participated in the competition. She said they had about 48 hours to paint at least two scenes for a competition with cash prizes. “They’re painting outdoors,” said Stockwell. “They put up with rain and wind. They are really good at it and we are very excited to have had them in Van Buren County for this competition. 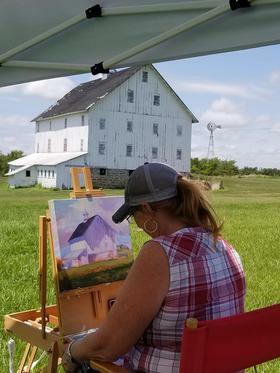 Stockwell said the artists were encouraged to paint scenes from the fairgrounds or from several historic locations, including the Barns of Van Buren County. She said they did a good job of spreading out throughout the county. In fact, four of the pieces entered in the competition were of the Galloway Barn. One of them came from Sheri Dill-Billings of New London, Iowa. She grew up in nearby Fairfield, so she knew exactly what she wanted to paint when the competition began. “My sister and I always joked around that when we retired, we were going to have a bed and breakfast. And [the Galloway farm] was going to be it. So this was exactly the farm that was our dream. So when we came back, I go, oh, I have to paint this barn. It was always something special to me,” she said. Dill-Billings and her husband spent about five hours at the barn on July 19. The first stint was about three hours before being rained out. The second stint lasted a couple hours before rain again forced them to leave. Dill-Billings said she drove home to New London after she was done painting for the day. She said she learned the storm destroyed the barn from her daughter, who called to tell her that she had just driven past the site. Unbelievable was a word tossed out a lot when talking to people about how the final moments of the Galloway Barn were captured on canvass. All of the paintings in the competition were up for sale. At one point, Sharon Galloway told Mel Stockwell that she was willing to buy all four of the paintings depicting her barn. Stockwell said Brad Klodt had already purchased one of them, but Galloway could buy the remaining three, which she did. And one of the three she purchased was the piece by Sheri Dill-Billings, who was about to reveal the price tag for her painting of the barn when Sharon walked up and handed her a check for it. Copyright 2018 Tri States Public Radio. To see more, visit Tri States Public Radio. In the studio to talk more about small farms producing food grown and generally consumed in central Illinois is Bill Davison. 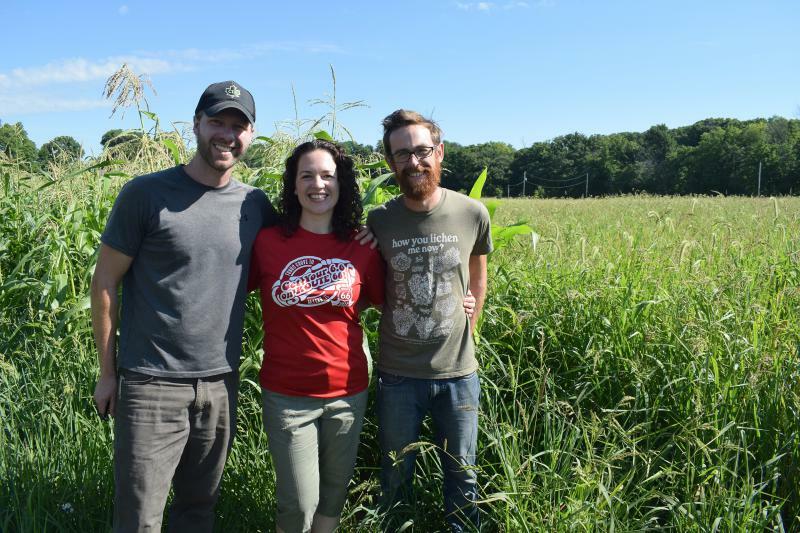 As the local food systems and small farms educator with the University of Illinois Extension, Davison works with hundreds of small organic farms in Illinois and the Midwest.